BEST Competitions have been in development since 2003 as 2 weeks events for students around Europe. Lately the Local BEST Groups around Europe have been implementing the idea locally and providing their fellow students the opportunity to challenge their skills and creativity. As the competitions grew more popular, national and regional rounds started popping up around Europe, which has lead to the creation of a European round and finally an International round. 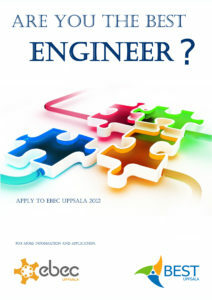 As a participant in the uBEC you will have the opportunity to move on to the Nordic BEST Engineering Competition (nordBEC) and then further on to the European BEST Engineering Competition (EBEC). The competition is in two categories, Team Design and Case Study. Team Design is to build a device that performs the actions needed to solve the problem and a Case Study is to solve a technical or a management problem. Each team will be required to present their solution and in for Team Design explain their choices of design at the end of the competition. You can find more info about the uBEC at the dedicated uBEC-site. BEST Competitions have been in development since 2003 as 2 weeks events for students around Europe. Lately the Local BEST Groups around Europe have been implementing the idea locally and providing their fellow students the opportunity to challenge their skills and creativity. As the competitions grew more popular, national and regional rounds started popping up around Europe, which has lead to the creation of a European round and finally an International round. 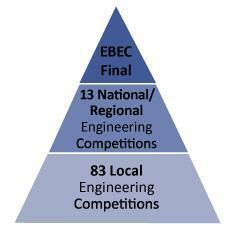 Since 2009, BEST Uppsala has organized three engineering competitions. The competition is often either divided in two categories, or focuses on one of the categories: Team Designs and Case Studies. Team Design is based on building a device that performs the actions needed to solve the problem and a Case Study is to solve a technical or a management problem. When the time is up, each team has to present their solution infront of a jury and motivate their choices of design at the end of the competition. The winning participants qualifies to the second round, EBEC Nordic and has a chance to proceed to the big international competition.